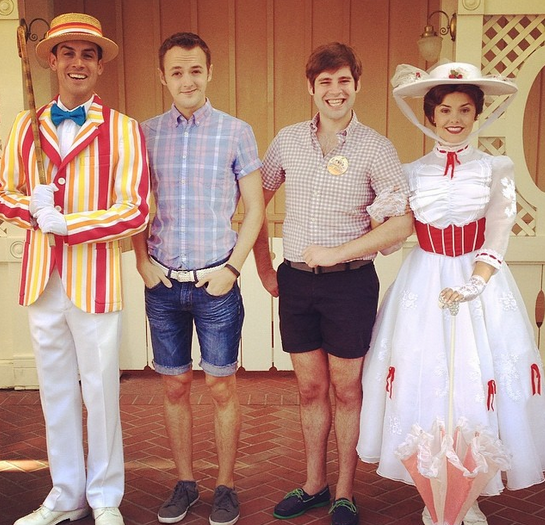 My friend Scott and I with Mary Poppins and Bert. I’m trying to make a Bert face. Meeting characters is an integral part of a day at Disneyland Resort for many Disney fans. Both Disneyland Park and Disney California Adventure Park, in addition to the nearby Downtown Disney District and on-property hotels, have a decent amount of character meet & greet locations. There are character greeting components in popular parkgoer activities like Disneybounding and the growing number of runDisney events. Plus, we cannot ignore the giant Elsaphant in the room, with waits for characters from Frozen often exceeding three hours! (No offense meant to the lovely ladies who play the very svelte and lovely snow queen.) And who can resist taking an Instagram selfie with Mickey? In a short series, let’s take a walking tour of various character meet & greet opportunities across Disneyland Resort. First up: Disneyland Park. 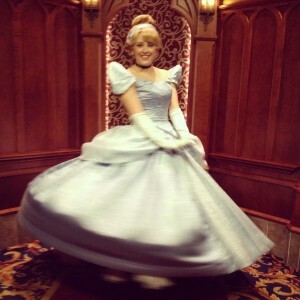 Especially in the morning, Disneyland Park is very front loaded with meet & greets. There’s just something that can’t be beat about making it in time for a rope drop at the park and running into Mickey and the gang right away. This part of the park is also a great place to catch rotating Disney Princesses and a few other characters, including Mary Poppins. Sometimes you pass all the nice friendly characters offering you a high five or a hug, and you hear the perfectly scathing voice of Cruella De Vil shouting things at you walking by. Even if you choose not to wait in line, standing and just watching her could almost be an attraction in itself. Crossing into Fantasyland, you may find yourself wanting to see a few warmer faces in Fantasy Faire. (Or some colder ones if your child wants to meet Anna & Elsa. I myself haven’t braced that line yet. Although I do enjoy stopping to watch Olaf chat with the crowd for a moment.) Closer to the front of Fantasyland, you can often meet Cinderella, Aurora, Tiana, Mulan, or other princesses in the Royal Hall. Merida has also recently been spotted in Fantasy Faire. Elsewhere in Fantasyland, you may run into a few more familiar characters. 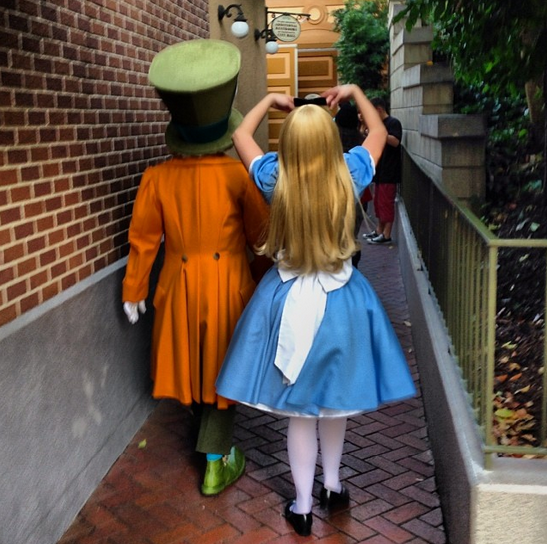 Especially now that the Alice in Wonderland attraction has reopened, there’s always a little madness in the air. If you move clockwise from Fantasyland into Tomorrowland, you can swap your Princesses for Heroes. (At least for now, until they potentially move into Disney California Adventure.) Sans Hulk, Black Widow, and a few of the other Marvel characters that would make awesome meet & greets in my opinion, Innoventions is home to many of your favorite Avengers. Captain America and Thor are often hanging around. While these are more separated and don’t allow for interactions between the two of them, they make fun meet & greets on their own. One small thing about the meet & greets in Innoventions, though, is that a few parties behind you might be sent in at the same time as you. You may find it a little awkward when other guests are watching and listening to your character meet & greets, especially if you have young children in your group and others are taking lots of photos. Hop on the Disneyland Railroad and get off in New Orleans Square, and just a short walk away are a few other wonderful opportunities to meet characters. Big Thunder Ranch features various sets of rotating friends throughout the year. Some fan favorites have been the group of Disney rabbits around Easter. It’s not very often that you see Roger Rabbit in the park! 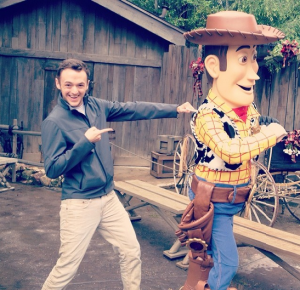 Elsewhere in the land, you also might be able to find Woody, or a few of your more Western-suited favorite Disney faces. You could swing by another land to visit Aladdin & Jasmine, Tinker Bell, Winnie the Pooh, and others, but more characters await you elsewhere on the resort. Coming up: Meeting some favorite characters at Disney California Adventure. 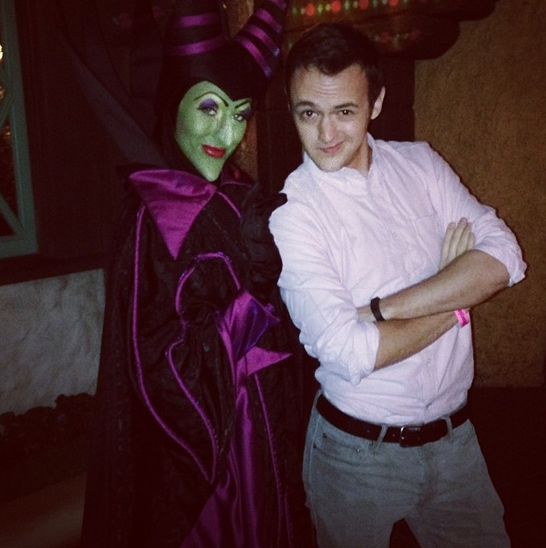 Adam Britten is a self-described Disney geek. At different points in his life, he has been an Annual Passholder at Walt Disney World, Disneyland Resort Paris, and Disneyland Resort. He's also a big fan of Disney on Broadway, has been on three Disney cruises, and is actively involved in RunDisney. He works professionally in social media marketing, and when he's not working or doing anything Disney related, he enjoys travelling, visiting museums and non-Disney theme parks, running, and baking. He can be found on Twitter and Instagram @AdamBritten. Join us for a Long Lost Friends Meet this Sunday at Disneyland! April 12, 2013 Guy Selga Jr. 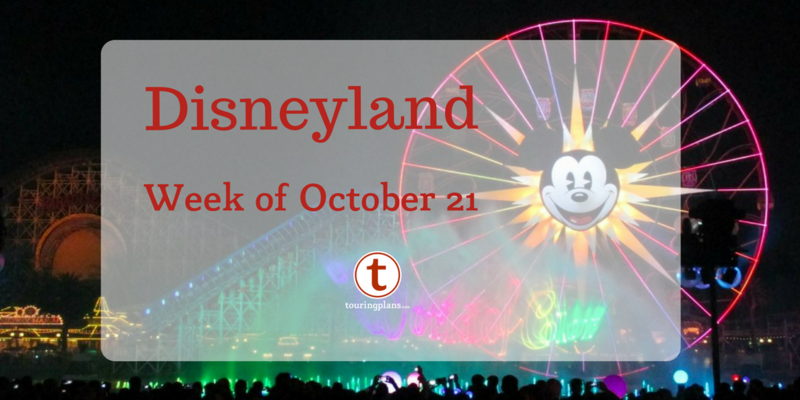 Comments Off on Join us for a Long Lost Friends Meet this Sunday at Disneyland! Thanks for the blog Adam. I am planning to have a character greeting day during my next visit to the World (Easter 2015), it would be great to get a post about characters at WDW. Hi Sarah – I think one of the other Touring Plans writers is planning on doing a WDW version of this! 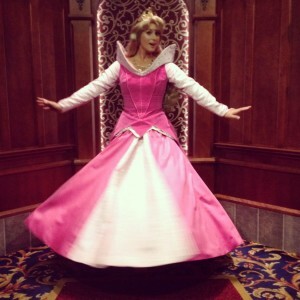 I’m also doing a DCA characters post and a post about character dining at the Disneyland resorts. Stay tuned! 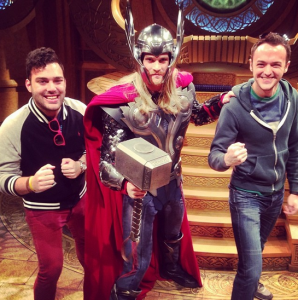 Just as a tip from recently visiting Disneyland in early July for Thor and Captain America M&Gs. We got there right at 11am when they opened. Instead of stopping to admire Iron Man’s Armor Room and/or “Suiting up” I would either go straight to Thor to meet him (who was the more personable of the two) or skip everything and circle back afterwards and see Capt America first. When we walked in, Capt America had no line, but we stopped to do Iron Man’s video thing which took time. By the time we finished, Thor and Capt America had ridiculous waits. Go see them first and then do Iron Man, even if your kid is freaking out b/c they see Iron Man’s suits.